Divekick. You dive, and then you kick. This is a title that’s most simple in concept but really has the potential to be fun and challenging. At a Mad Catz event in Boston, Massachusetts, I was able to sit down with Divekick‘s creator, Adam Heart, and I guess you can say he showed me some of the ropes. Or rather, he showed me how to lose—every time. It’s pretty clear that Divekick is slowly becoming a show floor hit at PAX East 2013. This game is all about the mechanics. Each character can jump, dive, and kick, but everyone has a unique ability that can be used in a fight. The character I found I liked most, Kung Pao, is able to do a kick through a portal, traveling partway across the screen to land a blow. Another character has the unique ability to move forward, which gives him an advantage over other characters, who cannot move forward. Each match looks to be 15–20 seconds long, so it’s easy to win or lose, and then move on. And speaking of winning and losing, all you need to do to win a match is land a single kick on your opponent! Divekick has a fun charm to it that brings a certain comedic element to the screen. Each character seems to be doing their own thing; when you start to make them jump and kick, they’ll continue doing whatever. For example, there’s a nurse who scribbles down notes on a clipboard, but she’ll continue to do this even during a fight. Also, in certain cases, when you kick someone hard enough or in just the right way, they will bounce into the sky, never to return. These simple elements of jest really helped to keep me entertained. 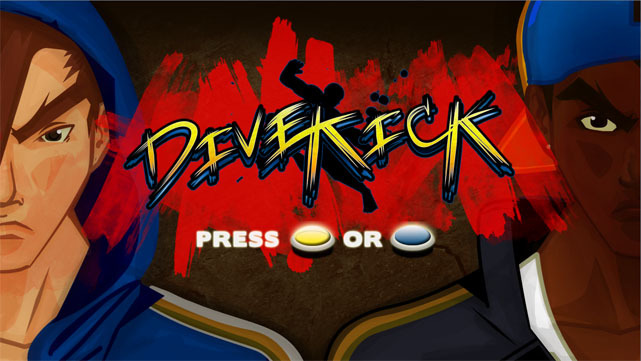 Originally developed by One True Game Studios, Divekick is now being co-developed with and will be published by Iron Galaxy Studios. It will be released later in 2013 for PCs and on PSN for the PS3 and PS Vita.